Crenshaw High on 11th Avenue in Los Angeles has a bad reputation. When I told a teacher at Animo Pat Brown Charter High School in South LA that I’d be reporting on Crenshaw, he rolled his eyes. Crenshaw, he had heard, was rife with gang violence. It had even temporarily lost its state accreditation a few years back. “I’ve never been to Crenshaw,” the young teacher said. “But kids are safe here.” He gestured to his own newly constructed social studies classroom, outfitted with seven new Dell computers donated by a philanthropist. The visible differences between neighborhood schools and well-funded charters such as Animo Pat Brown have encouraged thousands of South L.A. parents to withdraw their children from traditional public schools over the past decade. Working- and middle-class African-American families once predominated at Crenshaw, and many still live in the surrounding neighborhood. Darryl Strawberry is a Crenshaw alumnus; his 1979 Crenshaw Cougars baseball squad is remembered as one of the most talented high school teams ever. But today, middle-class families have, for the most part, pulled their children out of Crenshaw. 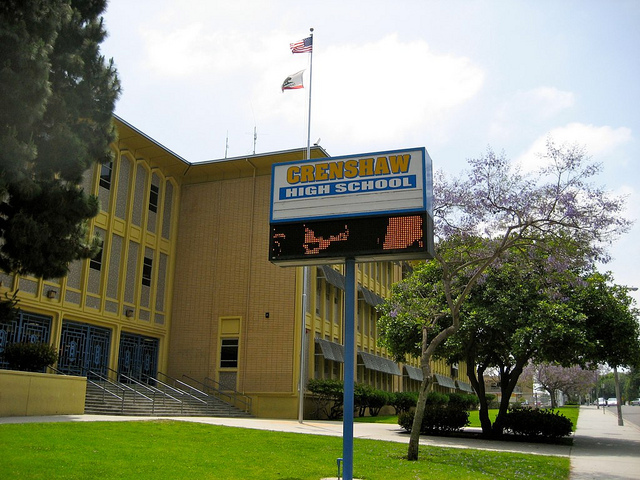 In 2004, Crenshaw High housed 3,165 students; today, fewer than 2,000 teenagers are enrolled. Eighty-one percent of the students live in poverty, and 12 percent hail from homes where no English is spoken. The school also has many students who live under the care of the state, in group homes or foster homes. Unsurprisingly, Crenshaw’s academic performance is abysmal: just 3 percent of students are proficient in math, and 25 percent are proficient in language arts. The Obama administration has declared the school “persistently failing”–among the bottom 10 percent of high schools nationwide. Yet, as is so often the case in education, statistics don’t tell the full story. A remarkable reform movement has taken hold at the school, driven by veteran teachers frustrated with constant administrative turnover. (Crenshaw has had five principals in nine years). Those teachers are committed to the difficult work of “turnaround”–transforming a school without shutting it down or changing its student body. With funding from the Ford Foundation and the federal government’s School Turnaround program, Crenshaw is pursuing a reform model that eschews some of the most popular strategies in the “accountability” playbook, like mass staff layoffs and teacher merit pay tied to student test scores. Instead, the turnaround focuses on creating a new curriculum to show students how education can improve not only their lives but also their struggling neighborhood. Crenshaw’s reform plan breaks the school up into teacher-led “small learning academies” with themes such as “business” and “social justice.” Within each academy, teachers work together to create interdisciplinary units built around community problem-solving. In math, students graphed the relationship between income and social opportunity in various south L.A. neighborhoods. In social studies, they read conservative and liberal proposals for school reform and practiced citing data in their own written arguments about how to improve education. In science, students designed experiments that could test policy hypotheses about how to improve education. And in English class, they read Our America, a work of narrative non-fiction about life in the Ida B. Wells housing projects on the South Side of Chicago. Working with researchers at UCLA and USC, Crenshaw students also conducted surveys on local food and health issues. The school has a community garden in which student volunteers grow produce to sell at local farmers’ markets. Last year, one senior earned $1,000 per semester coordinating this work as an intern at Community Services Unlimited, a nonprofit that focuses on urban agriculture and food issues. Placing students in professional internships, some of them paid, is a key element of the Crenshaw reform plan. “Extended learning time” is a popular school-reform strategy, but Crenshaw’s reformers say it shouldn’t just take place in the classroom. What’s heartening about Crenshaw’s plan is that it is rooted in solid research on the reasons why kids drop out of school: because they find it boring, because they don’t see how it connects to the world of work, and because they would rather be earning money. Many education reform efforts focus more on rewarding and punishing teachers than on training them to be better at their jobs, but the Crenshaw program provides teachers with intensive professional development and pays them bonuses for it. A big focus of the training, led by USC professor and Crenshaw interim principal Sylvia Rousseau, is how to fit the new, national Common Core curriculum standards into these creative, interdisciplinary lesson plans. The school will need time and political space if it is to test the impact of its reform plan over the long term. For now, LAUSD superintendent John Deasy, who formerly worked for the Gates Foundation, has expressed support. Crenshaw will also need to tell its story–to fight the assumptions outsiders have about the school: that it is dysfunctional, violent, and stagnant. Dana Goldstein is a Schwartz Fellow at the New America Foundation and a Puffin Fellow at the Nation Institute. You can follow her work at www.danagoldstein.net. Crenshaw High, Dana Goldstein, education, South L.A.